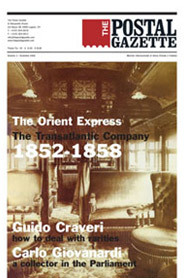 On October 4, 1883 the CIWL inaugurates the Express d'Orient between Paris and Giurgewo (in Romania) via Munich-Vienna-Budapest. From Giurgewo the voyage proceeds by boat via Danube and Black Sea till Constantinople, for a total journey of about 80 hours. On board ministers, diplomatists, journalists but any woman, in the name of the scarce security of central-eastern Europe. In 1889 the train, already became Orient Express, is routed form Budapest via Beograd-Nis-Sofija and, for the first time, it arrives in Constantinople in less than 70 hours without transshipments imposed to passengers. Postal History of the services with covers travelled on this line. By Paolo Guglielminetti.